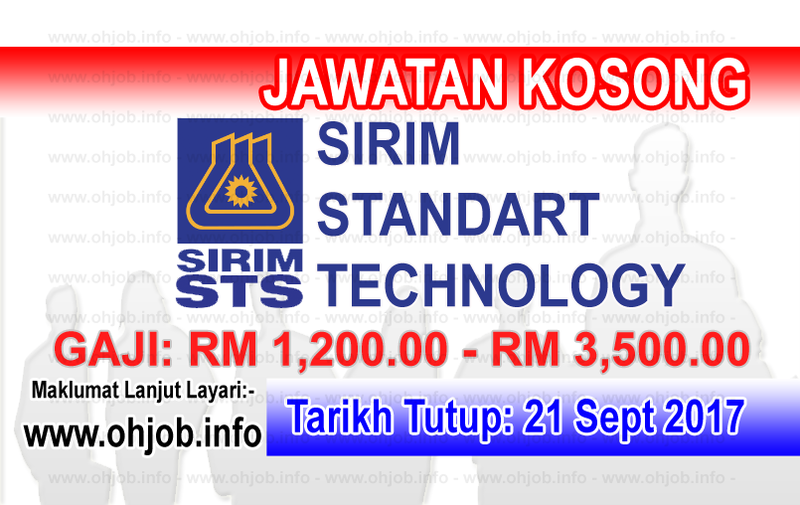 SIRIM Standards Technology Sdn. Bhd. (SST), a wholly-owned subsidiary of SIRIM Berhad are one of the calibration laboratory in Malaysia. We also earn for the ISO 17025 certified lab which also an accredited lab in Malaysia to offer you a one-stop center offering comprehensive and diverse range of calibration and measurement services. SST, a subsidiary of SIRIM, the premier industrial research and technology organization in Malaysia. Backed up by our pool of experts and well-equipped laboratories, we provide Innovative Businesses and Technology Solution to meet the needs of diversified market sectors such as Oil and Gas, Manufacturing, Aviation, Semiconductors/Electronics, Utilities, Education, Defense, Automotive, Telecommunications, Agriculture, Healthcare, and Construction. Terima Kasih Kerana Membaca Dan Menyemak Jawatan Kosong SIRIM STS (21 September 2017) Selamat Memohon Dan Semoga Berjaya Kami Ucapkan, Sila LIKE Facebook Page Kami Dan Kongsikan Kepada Semua.